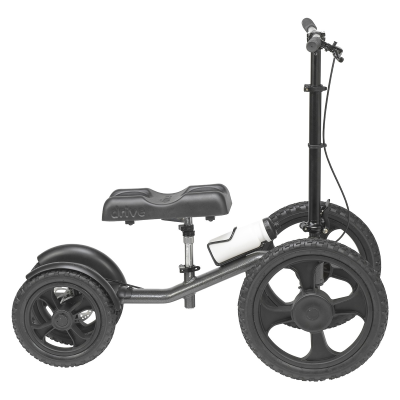 The Boulder All Terrain Knee Scooter is the best solution for those with ankle, foot, or toe injuries that need to be non-weightbearing but still wish to travel, hike, and move across rougher terrains with ease, comfort and safety. Independently Yours Medical Supplies in Louisville, CO rents the KneeRover All Terrain Knee Walker, featuring rugged 12″ pneumatic wheels. There is also a locking hand brake for the rear wheel, as well as an adjustable foam knee pad and folding handle bars. Navigate your home, work, and any terrain with ease – including grass, gravel, dirt and gaps in sidewalks. Available for daily, weekly and monthly rates. Stop by our store to test drive one today. – Product Weight: 24 lbs. 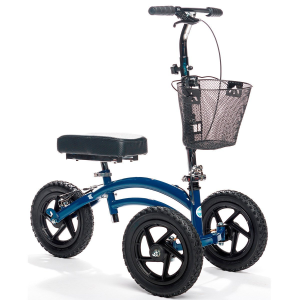 Boulder Knee Scooter Rentals are perfect for all terrains including dirt, gravel, snow, streets, indoor and outdoor. If you live in or near Boulder, Louisville, Denver, Broomfield, Arvada, Westminster, Longmont, Erie, Commerce City, Superior, Brighton, or Lafayette visit or call us to rent an all terrain knee scooter for your foot, ankle or toe injury.